DAVIDSON, Anstruther (1860-1932) was a Scottish physician and graduate of the University of Glasgow at age 21. Six years later, in 1887, he obtained his medical degree. Davidson emigrated to America in 1889 where he practiced medicine, dermatology in particular, in Los Angeles. Like many in the medical field, his passion was for natural history—insects and plants. In 1923 he co-authored Flora of Southern California with George Moxley. Davidson made multiple plant collecting trips to Santa Catalina Island in the 1890s; to Santa Cruz Island in 1893; and to San Clemente Island in 1897. Davidson married Alice Jane Merritt (1859-1931) who, like Davidson, was interested in natural history. She too collected plants on Santa Catalina Island in the 1890s. 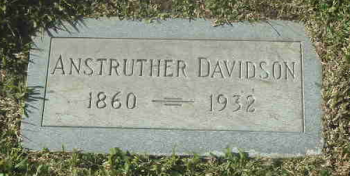 In January 1932 Anstruther Davidson was struck by a car, suffering internal injuries. He died three months later at age 72. He and his wife are buried in Hollywood Forever Cemetery, Los Angeles. This page was last edited on 2 June 2016, at 22:35.